Dreaming up novel ways to serve vegetables in a healthful, interesting way can be tougher than helping my third-grader with his math homework (quadrilaterals and exponential numbers, anyone?) . Spaghetti squash is one of the vegetables we turn to when we tire of carrots, broccoli, and salads. Its slight crunch makes a wonderful side dish when mixed with chipotle peppers, queso fresco cheese and cilantro. 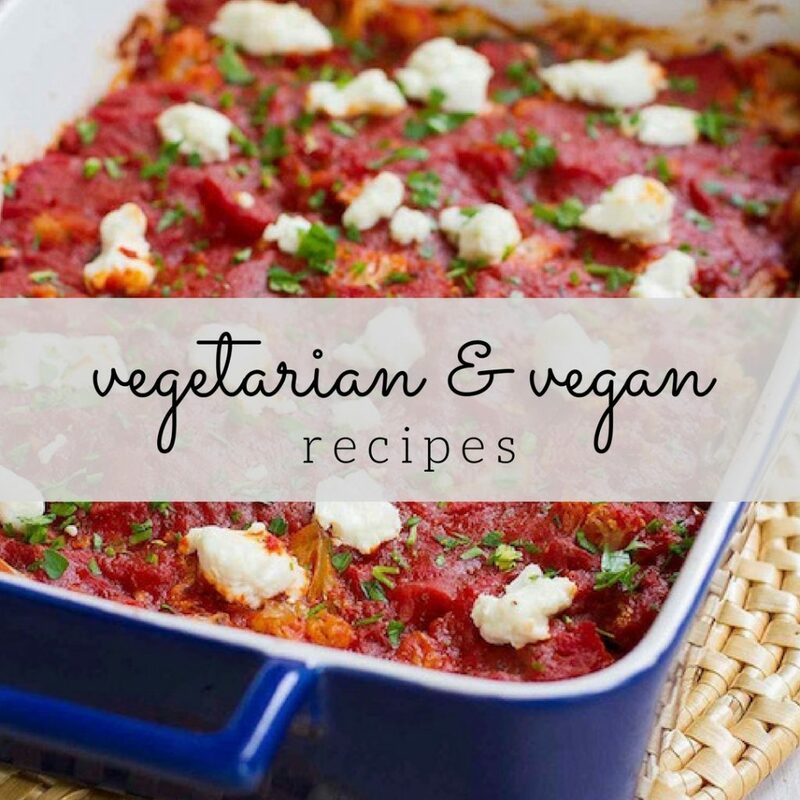 Alternatively, it can stand in as an entree on Meatless Monday when paired with Spinach, Feta and Cannellini Beans. I made this recipe for a guest post on my friend Jennifer’s wonderful site, Savoring the Thyme. 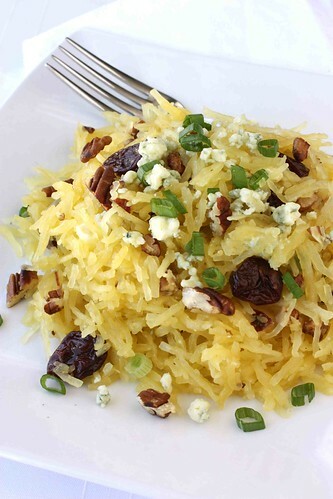 Sweet dried cherries, creamy Gorgonzola cheese and toasted pecans are mixed into the spaghetti squash, along with a light vinaigrette, for a healthy, unusual side dish. Your family won’t get bored of this one. Head over to Savoring the Thyme for the recipe and to find out how I turned my son orange. Seriously. Mmmm, this looks delish Dara!! I SO love spaghetti squash. I've made something similar and DELISH! Hope you're having a great week! Dara this looks fabulous. I have never mad spaghetti sqaush but after seeing this i have no choice. Great idea. This sounds amazing. I have never tried spaghetti squash?? It looks like I am missing something…. The only way I have ever had spaghetti squash is with tomato sauce. I love this idea and it has all my favorite ingredients. Love this post. I'm so inspired! Thanks for the reminder to eat more spaghetti squash. I often pass it up in the market because it seems like a lot of work to prep, but it isn't, really, and this combination of flavors looks delicious. Mmmm! I love new spaghetti squash recipes…can't wait to give this one a go! I love all the wonderful flavors you used in this spaghetti dish… It looks delicious! I'll have to try it for dinner some night. I still haven't tried spaghetti squash. 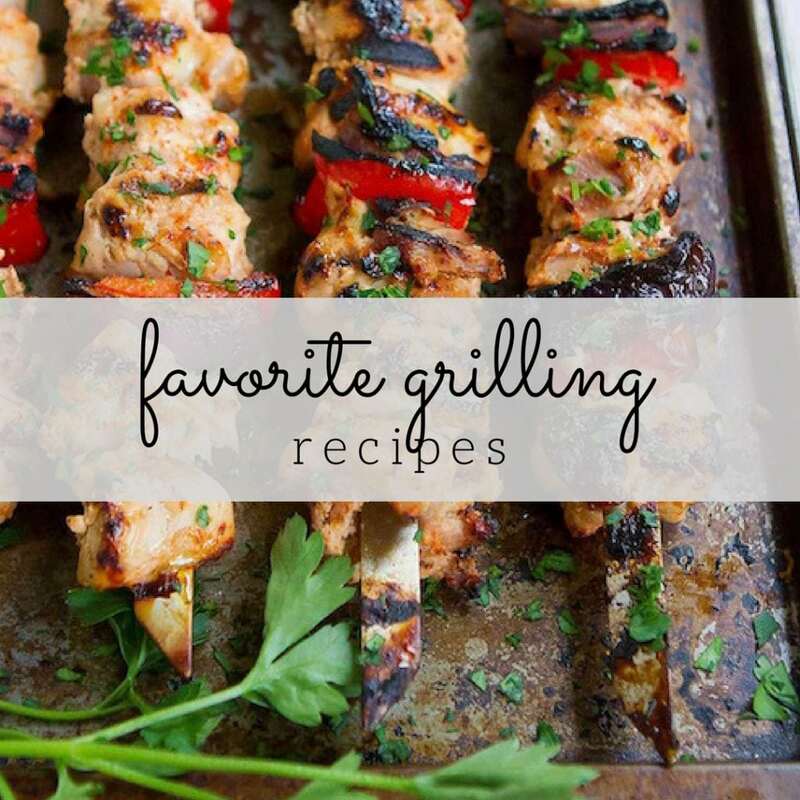 This recipe is definitely going on my list! someone was asking me about spaghetti squash, I can't remember who. I've never cooked it before but it does look intriguing. I just picked up spaghetti squash… now I'm actually looking forward to using it! We barely use it in Indian cooking but I've seen some very wonderful recipe using them and this one's making me wanna try it once. Somehow I felt it will be mushy but if u say its crunchy I might give it a try. Heading over check the recipe! Thanks for posting this recipe. 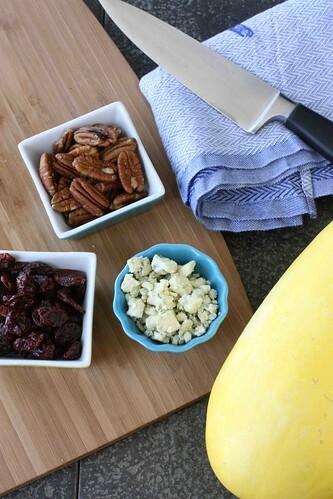 It's so easy to make spaghetti squash, and this is a great way to add nice flavor to the dish! I love the sound of this dish!! As long as it's not supposed to substitute real spaghetti, I think the squash is quite genius. The texture is amazing, but it's the add-ins that make it outstanding. I love the idea of this! I have stock piled squash for winter and have only done spaghetti squash with marinara sauce (which is really good too). Thanks for the new twist! I really need to pick up a squash and try this. I'm willing to bet my kids would love it! Beautiful dish Dara. I'm going to give this a try. Every time I cook spaghetti squash it comes out mushy. I'll follow your instructions and see if I have better luck. Fabulous dish! Off to pick up a spaghetti squash NOW! This is a perfect dish for me and I can't wait to make it. You keep me inspired. Many thanks! Love the idea of spaghetti squash but my couple of attempts were complete fails. Didn't like how it turned out!! Maybe just wrong recipes….now that I have yours I bet I will like if I attemt it this time around:). Yum. I love spaghetti squash, but usually when it isn't fixed like actual spaghetti. Thanks for this. It looks gorgeous. This looks de-lish! Someone just mentioned spaghetti squash to me over the weekend and I realized I've never had it. This sounds like a perfect recipe to try! Dara, I often mix spaghetti squash in with turnip greens (http://noshesthoughtsreves.blogspot.com/2009/06/sauteed-turnip-greens-and-spinach-with.html) but this sounds like a wonderful alternative! I would definitely like to try this! 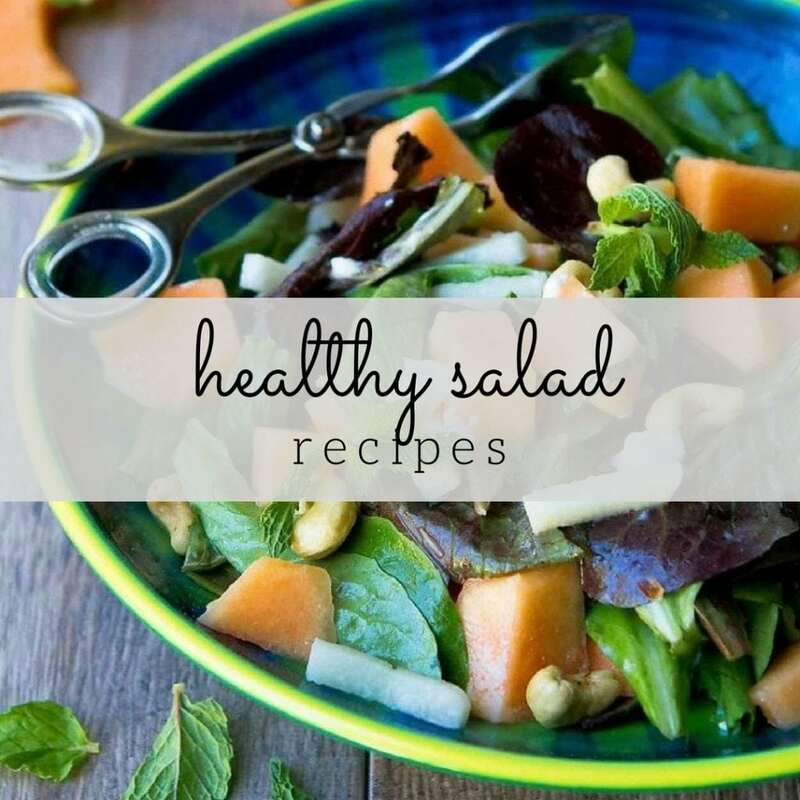 I am always looking for healthy dishes to taste!